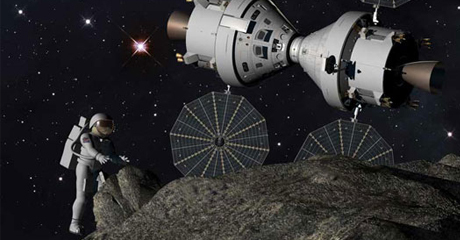 The U.S. space program is pursuing two goals to expand the dominion of the human race: flying astronauts to an asteroid by the year 2025 and landing astronauts on Mars by the 2030s. NASA Director Charles Bolden called on the space community and the aerospace industry May 6 to help solve some of the technological problems that must be overcome if those goals are to be met. Thirteen years of astronaut experience in low Earth orbit on board the International Space Station (ISS) have created a solid body of knowledge about life support. A 2015 mission offers further opportunity for learning, Bolden said: A U.S. astronaut has accepted a yearlong assignment on board ISS for study of the body’s reactions and performance during a prolonged sojourn in space. The goal to “identify, capture and relocate an asteroid” is also in development, following a goal laid out by President Obama a few years ago, Bolden said. That mission calls for astronauts to explore the surface of the asteroid and sample the materials in its composition, which are expected to help us better understand the earliest formation of the solar system. The mission will also help determine if an asteroid could serve as a stepping-stone to Mars and whether materials on the object might offer resources to supply the last leg of the journey to the Red Planet. Expanding our understanding of asteroids might also provide insight into what humanity could do to avert a potentially devastating collision if such an object should intersect Earth’s orbital path. The landing of the rover Curiosity on Mars in August 2012 was a landmark achievement for NASA and its many international collaborators who contributed various technologies to the Mars Space Laboratory (MSL), which is sending back a steady stream of data about conditions on Earth’s neighboring planet. “We’ll soon have radiation data from an instrument on Curiosity that will help us better understand and overcome challenges to human life in the Martian environment,” Bolden said. Before Curiosity, the rovers Spirit and Opportunity landed on Mars nine years ago. The data they returned helped identify the spot where scientists decided to land the rover Curiosity to search for habitable environmental conditions. Spirit has been silent since 2010 but Opportunity is still operable and transmitting data. With its first few months on the planet, Curiosity gathered enough information to give scientists certainty that flowing water, likely pure enough to drink, once flowed on the surface of what is now a cold, dry planet with little atmosphere. The NASA plan and its projected budget allow sustained monitoring of the surface rovers and orbiting craft, which also continue to send back important information. Future unmanned Mars missions are scheduled for 2014 and 2016 to gather further data in support of the crewed mission of the future, Bolden said. Bolden flew four missions on the space shuttle starting in the 1980s. He continues to work in the field today, he says, so his granddaughters can aspire to be space travelers. Bolden made his remarks at a Washington conference called humans2Mars sponsored by a nonprofit, nongovernmental organization called Explore Mars. The three-day event is supported by private-sector partners, some of them from the aerospace industry, that will be key players in developing the technologies that NASA is lacking for a Mars mission. A manned mission to Mars will require a “heavy lift” rocket and a multipurpose crew vehicle more advanced than any previously designed. The Obama administration is turning to the private sector to help develop those technologies. The president of Explore Mars, Artemis Westenberg, opened the conference May 6 by telling participants that “the future of humankind” is the core topic of the meeting, and they will sketch out the plans that will enable humans to travel to Mars and then live and work there. "Like a Disco Wonderland for Stars"